Infinite Art Tournament: Coffee Table Book Party: "Von der Revolution zur Perestroika"
Coffee Table Book Party: "Von der Revolution zur Perestroika"
...and as I mentioned a few days ago, the Coffee Table Book Party has recently lost some of its zip! 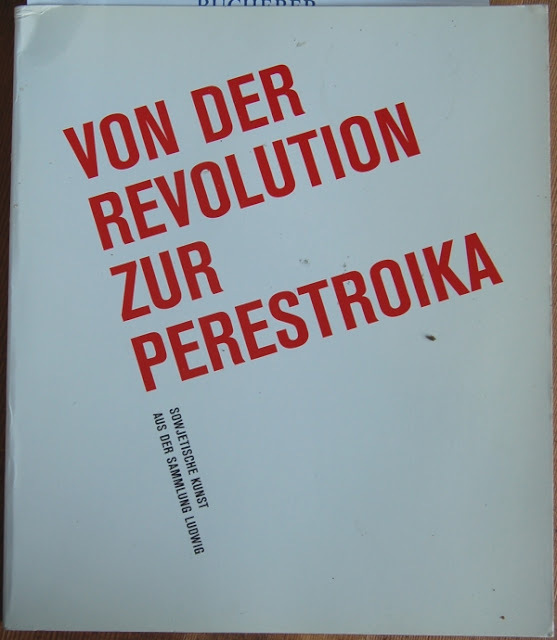 To get things moving again, lassen uns "Von Der Revolution zur Perestroika" betrachten! 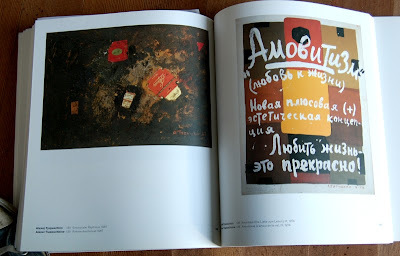 This is one of those art books that accompanies a touring exhibition, in this case a collection of Soviet art that was making the rounds in Germany in 1989, one of the last years that you could talk about Soviet art in the present tense. Naturally, it includes a sampling of the social realist/propogandistic stuff that you would expect and that Soviet graphic artists, for better or worse, often did very well. The Soviet artistic legacy is an interesting one. They pretty much screwed the Russian literary tradition, full stop. On the other hand, but mandating that composers keep music accessible, they fostered the only orchestral music from the middle third of the 20th Century (Prokofiev, Shostakovich, Kabalevsky) that anyone is still willing to listen to. Cinema was -- well, long story. 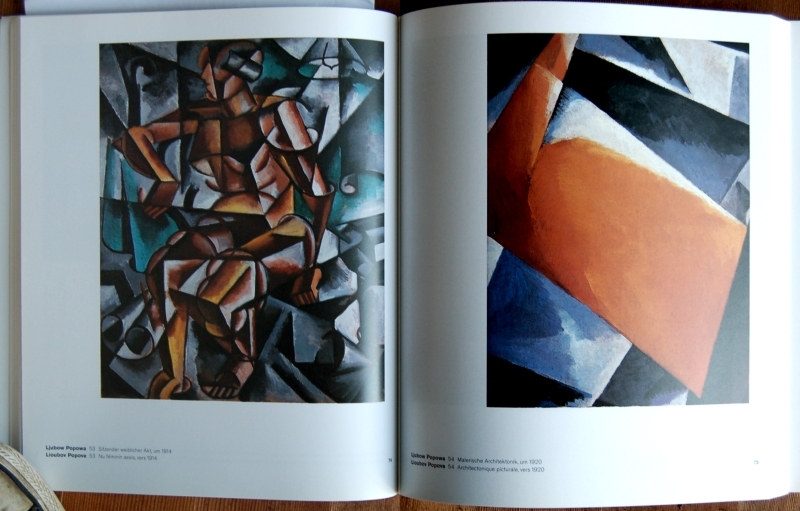 In painting, things eventually got pretty weak, but the first decade of the Soviet Union saw some really cool developments in abstraction. Often these have a compelling "lo-fi" feel for the unfortunate reason that everybody was starving and artists were often using poor paints on whatever pieces of wood or cardboard they could scare up. 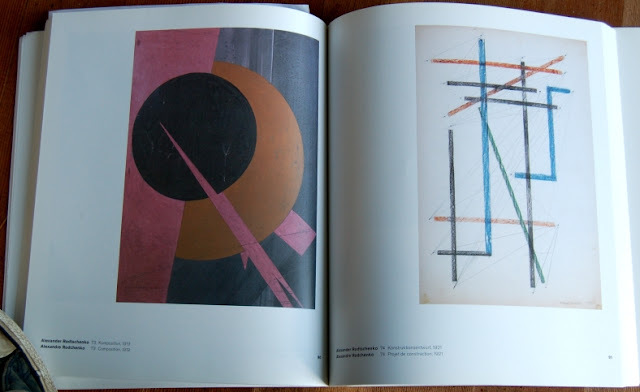 My favorite paintings of this period fall into a school that my staff Art Historians are telling me is called "Suprematism" -- complete geometric abstraction with, at least in its initial phases, deployment of vivid colors. The book is in chronological order, and due to the culturally slowed-down vibe of the USSR the impression is a panoply of art from the 1910s to the 1920s. 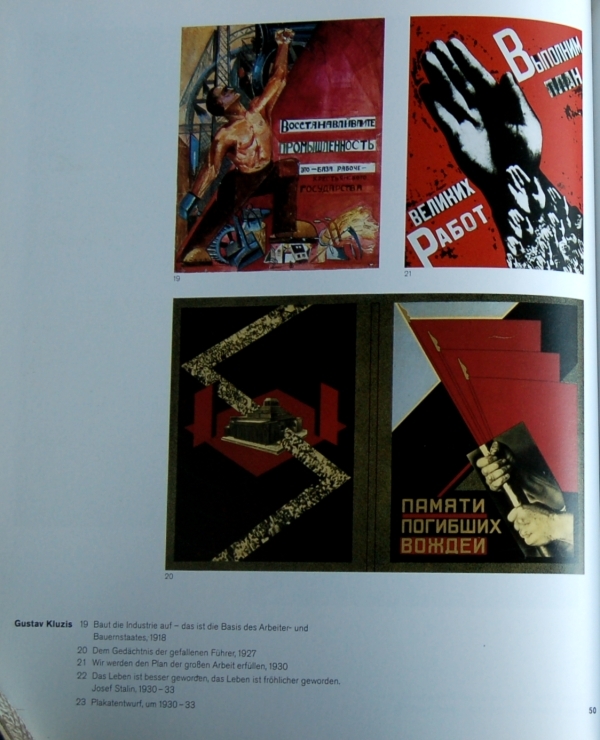 Here are some innovative pieces from 1974, fairly cool but perhaps a bit anachronistic by non-Soviet standards. If you wanted a copy of this book, you could get it for -- holy cats! -- 45 bucks used at Amazon! I had no idea! Um... ...or, I add with an opportunistic gleam in my eye, I might let mine go for oh, say, 30 bucks! Plus shipping! Very good price!